Roughly chop galangal, tumeric, ginger, garlic, shallots, candlenuts and chilli. Slice lemongrass. Cut eggplant into bite sized chunks. Cut tofu puffs diagonally. Peel and de-vein prawns, reserving the heads and shells. Lightly season prawns with salt and set aside. Add 1 litre of cold water to prawn heads/shells and bring to boil, then reduce to simmer for 30 minutes. Discard heads and shells. Fry laksa paste in a saucepan with remaining vegetable oil on medium-high heat for 3 minutes. Add prawn stock and scrape the bottom of the saucepan to remove any stuck paste. Bring to a boil and reduce to simmer. Add in coconut milk and rock sugar, stirring to dissolve. Add salt to taste. Add in okra and egg plant, simmering until almost cooked. This takes around 5-6 minutes. Add in prawns and simmer for 2 minutes. Add in tofu puffs and noodles to warm through for one minute. 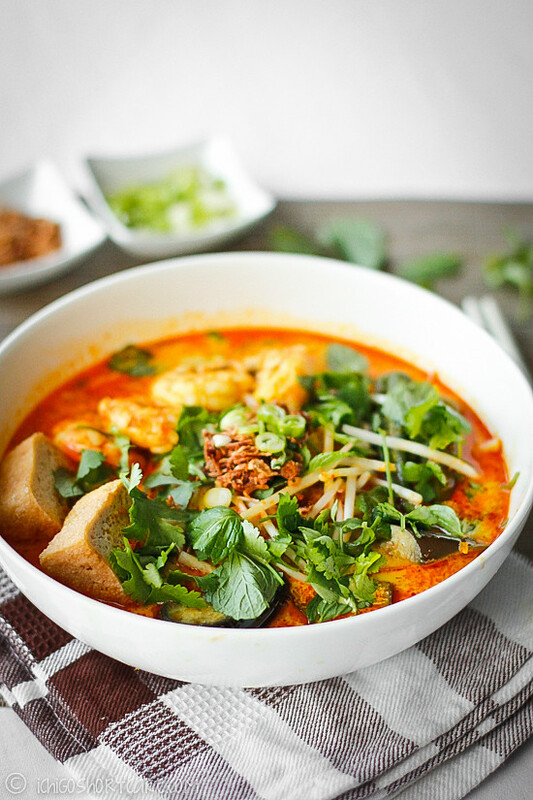 Arrange bean shoots in bowl, add laksa noodle, prawns, vegetables, tofu puffs and soup. Top with coriander, mint, spring onions and fried shallots and serve.